A Czech translation has been provided by Raveler Nemravka. It is available here. Děkuju mnohokrát! 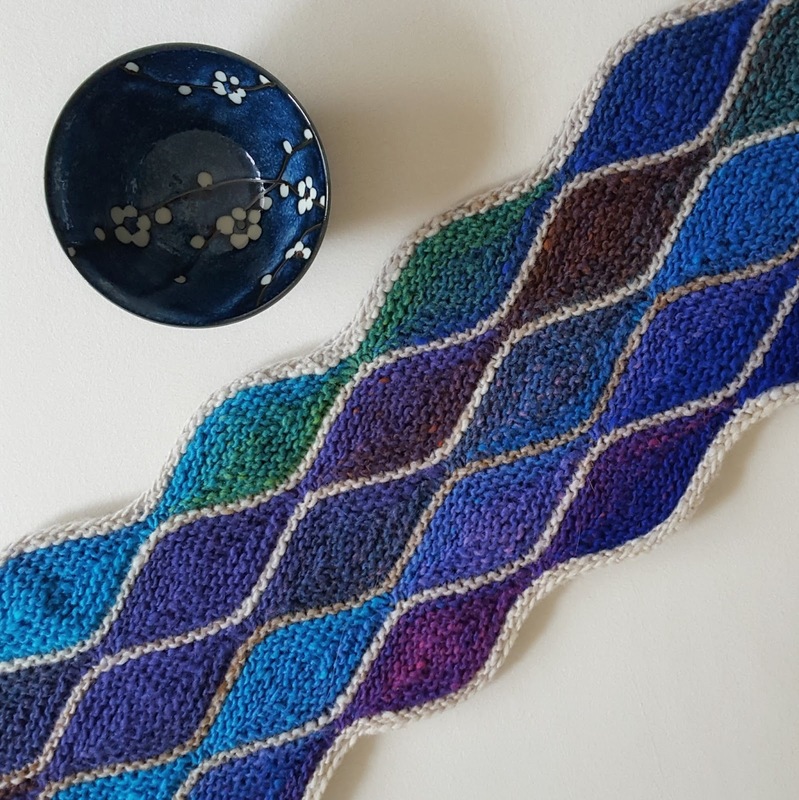 I used some Noro Kurayon (Colourway 40 as MC and Colourway 211E as CC) that I've had in my stash for quite a while. 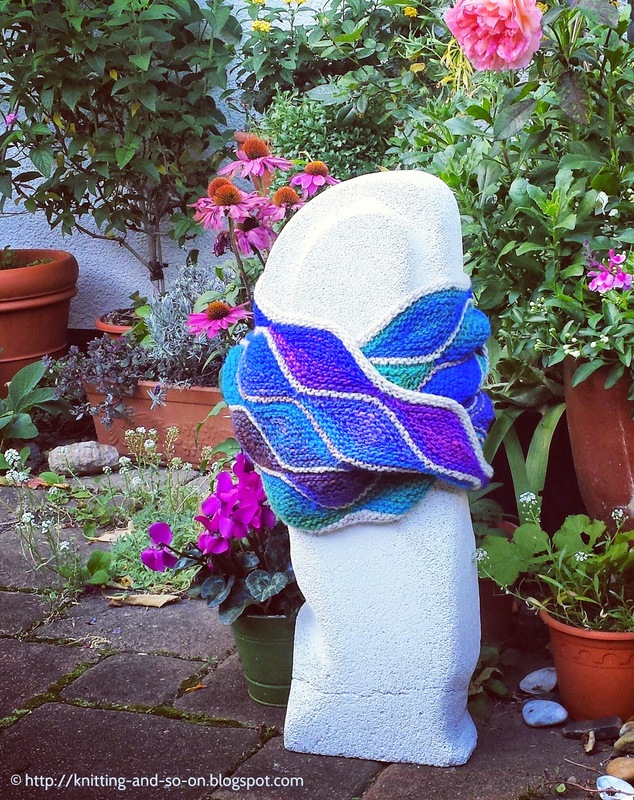 Knitted in the round, this cowl consist of almond shaped short row sequences that are knitted one after another. 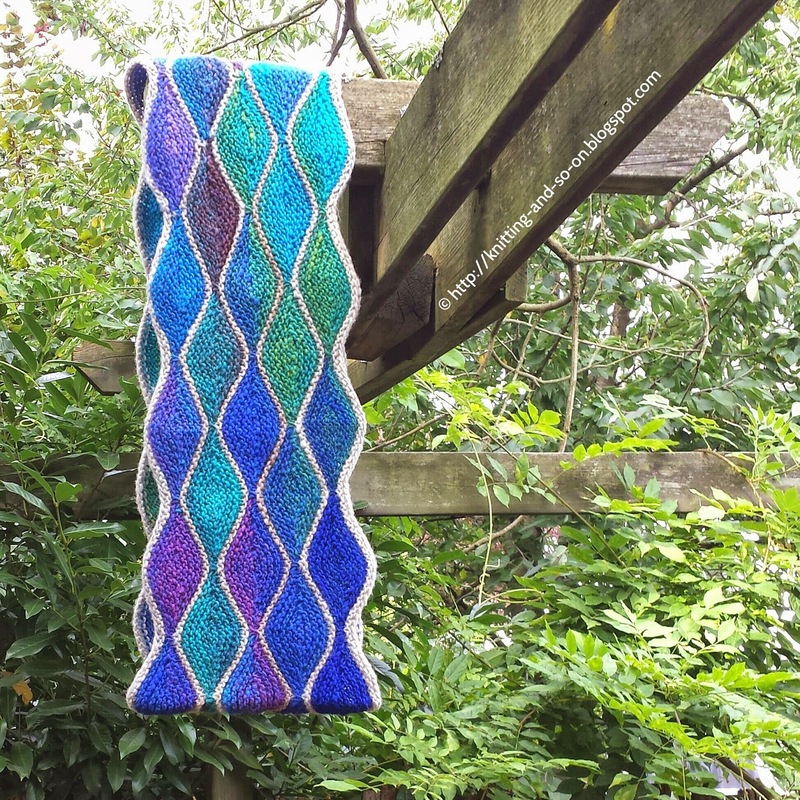 When one layer is finished, two full rows are knitted in a contrast colour. The next layer starts with an offset of 10 stitches. Short rows with double stitches (German short rows, t+p): when you turn, bring yarn to the front and pull it back so that a sort of "double-stitch" is created, then knit back as usual - when you have to knit the double-stitch, be careful to knit it as one stitch (see also https://www.youtube.com/watch?v=P6n561SMZXQ); this method has the advantage the no picking up of stitches is necessary. In the pattern, this stitch will be called t+p (turn and pull). Cheats to avoid cutting yarn: Since I try out a lot (and consequently frog a lot), I avoid cutting yarn at all costs. That's why I'd rather strand yarn over a few stitches (or more) or slip a few stitches. In case of this pattern, this is necessary to get either MC or CC yarn to the start of the new row. Purl one round, place a different marker to mark the end or round (this marker ("end marker") will be moved). Continue from Row 1 and knit the next almond-section. 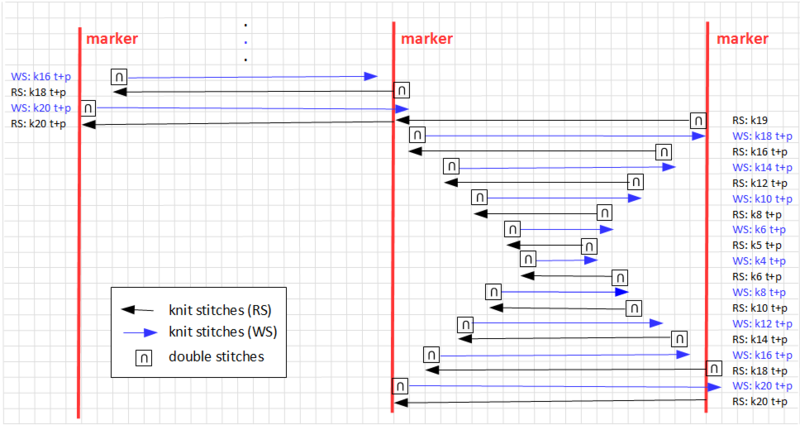 The picture below gives a sketch of the rows in relation to the stitch markers in odd numbered layers. 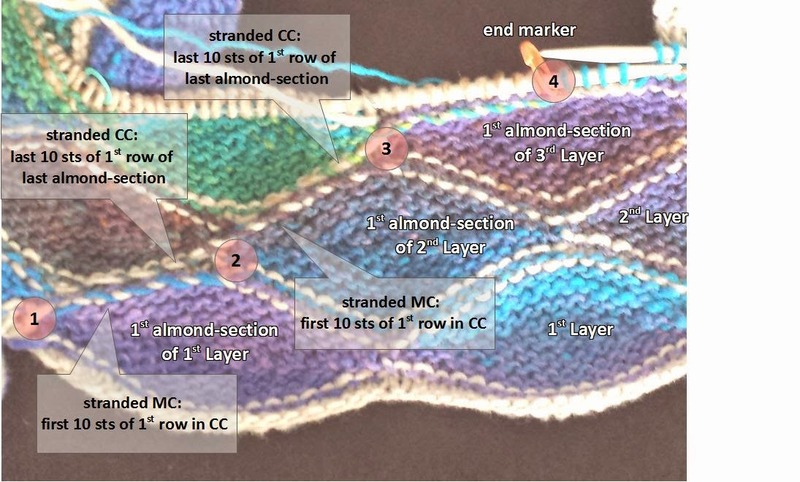 When you have finished the "almond section" that reaches the end marker or after you have knitted 10 "almonds" switch to CC. Purl one round. Remove the end marker, slip ten stitches, place the end marker. With MC start knitting the next almond - however, it is not knitted in the 20 sts between two stitch markers, but around one stitch marker (10 stitches on the left hand side and 10 stitches on the right hand side of the stitch marker). 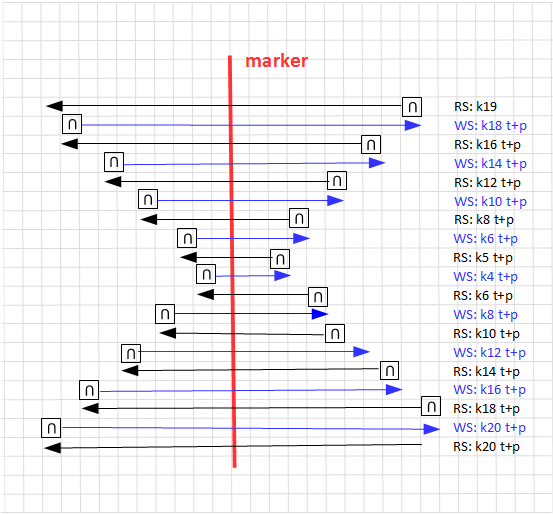 The picture below gives a sketch of the rows in relation to the stitch markers in even numbered layers. Repeat first and second layer until the cowl is wide enough for you. I knitted a total of 5 layers (3x odd-numbered layers and 2x even-numbered layers). Finish with one knit row in CC and bind off purling in CC. Another beautiful design. I love all your work and need to dedicate some time to knit them all. This is so gorgeous, at least your version is - but I keep on making mistakes! Do you have any hints on how to do it accurately?